AZ 960 is a novel ATP competitive JAK2 inhibitor with IC50 and Ki of <3 nM and 0.45 nM, 3-fold selectivity of AZ960 for JAK2 over JAK3. Claude HAAN Université du Luxembour. AZ 960 purchased from Selleck. Inhibition studies of AZ 960 are performed using a recombinant JAK2 kinase (amino acids 808–1132) at a peptide (Tyk2 peptide) concentration of 100 nM and an ATP concentration of 15 μM. Concentrations of AZ 960 ranging from 0.003 μM to 30 μM are used. The mode of inhibition and inhibition constant (Ki) of AZ960 against JAK2 kinase are further evaluated by inhibition kinetics. Specifically, a series of JAK2-catalyzed reactions are set up in HEPES buffer (75 mM, pH 7.3) with a fixed concentration of peptide (FL-Ahx-IPTSPITTTYFFFKKK-COOH), and varied concentrations of ATP and AZ 960. The progress of each reaction is subsequently monitored by the Caliper LC3000 system, and the initial velocity of each reaction is extracted from the corresponding reaction time course. To define the mode of inhibition, initial velocities are plotted against corresponding ATP concentrations using Lineweaver-Burk plots and the characteristic convergence of the lines on the y axis demonstrates the competitiveness of AZ 960 to ATP. 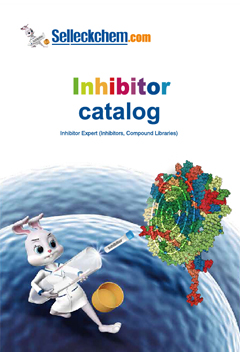 Initial inspection of Ki using the Michealis-Menten equation revealed that AZ960 is a tight-binding inhibitor of JAK2. 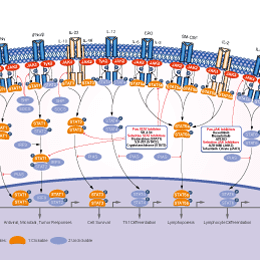 AZ960 is profiled against 83 kinases at three inhibitor concentrations (0.01 μM, 0.10 μM, and 1.0 μM). Method: Cellular proliferation is evaluated using the fluorometric/colorimetric BIOSOURCE AlamarBlue Assay and read in the Spectra Max Gemini EM microplate reader. SET-2 cells are plated at 20,000 cells/well, TEL-JAK2 Ba/F3 cells at 2000 cells/well, and all other TEL-JAKs at 5000 cells/well in 96-well plates. Cells are treated with AZ 960 24 hours after plating and grown for 72 hours for SET-2 and 48 hours for TEL-JAK Ba/F3 cells. Following the indicated growth period Alamar Blue (10 μL/well) is added, cells are incubated at 37 °C in 5% CO2 for 2 hours, and fluorescence is measured at 545 (excitation) and 600 nm (emission). Data are normalized to percent of the control, and GI50 values (the concentration that causes 50% growth inhibition) are calculated using Xlfit4 version 4.2.2 for Microsoft Excel. Gozgit JM, et al. J Biol Chem. 2008, 283(47), 32334-32343. Yang J, et al. Mol Cancer Ther. 2010, 9(12), 3386-3395. Ikezoe T, et al. Int J Cancer. 2011, 129(10), 2512-2521. Fedratinib (SAR302503, TG101348) : JAK2-selective, IC50=3 nM.